When growing mushrooms, your goal is to get your mycelium to colonize a new substrate as quickly as possible --- definitely within two weeks. As every gardener knows, nature abhors a vaccuum. Just as your garden beds will quickly become coated with weeds if you don't plant your veggies thickly or mulch them, your mushroom substrate will be full of harmful contaminants if you don't make sure your mushrooms get a head start. The best way to jump-start your mycelium in a new substrate is to sterilize or pasteurize the material to kill off the harmful competitors. Heat is the primary method used, but you have to be sure not to raise the temperature of your substrate over 200 F or you'll do more harm than good by waking up bad molds. 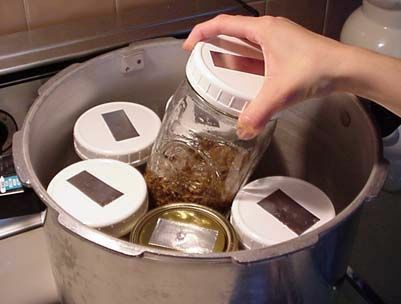 Sterilization sounded very difficult to me until I realized that the methods used at the home scale are basically the same as canning. Want to sterilize jars of grain? Just boil the grain in water for an hour, put it in clean quart jars, and then cook the whole thing in a pressure cooker for another hour at 15 psi. I soaked my cardboard substrate in hot water before inoculating, which I assume did a bit of sterilization at least. Of course, if you want to inoculate masses of wood chips or straw, they probably won't fit in your pressure cooker. 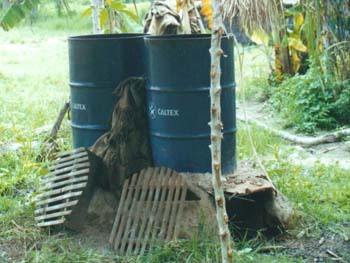 Paul Stamets offers an alternative method for pasteurizing bulk substrates at home --- fill a big pot or metal drum with water, put your substrate in a wire basket inside, and place over a propane burner or a fire. Straw needs to cook at 150 to 180 degrees Fahrenheit for an hour while wood chips should be cooked for twice as long. If you've enriched your wood chips, you may need to cook for as long as 5 hours. No matter how you sterilize your substrate, let it cool, then inoculate it with that mycelium you carefully grew according to last week's instructions. The fungus will do most of the rest for you! Check out our POOP-free chicken waterer, great in tractors. We have just started growing mushrooms at home and are looking at trying Oysters on a coffee/woodchip mix. We want to sterilise the woodchips- how is best to do this without a pressure cooker? We'll buy one if we decide to carry on with the mushrooms, but this early on we want to do it cheaply until we know whether we want to continue! THanks! Jo --- Depending on how fresh your substrate is, you might not have to sterilize the fruiting substrate for oysters --- they're very vigorous growers. Of course, the easy way is to simply insert them into logs that come pre-sterilized. What do you think about securing the woodchips in a large pillowcase and putting it in a clothes dryer on high heat? Would that work? Any potential downsides?